This painting is the first of a three part series that I'm doing for belovedranger. 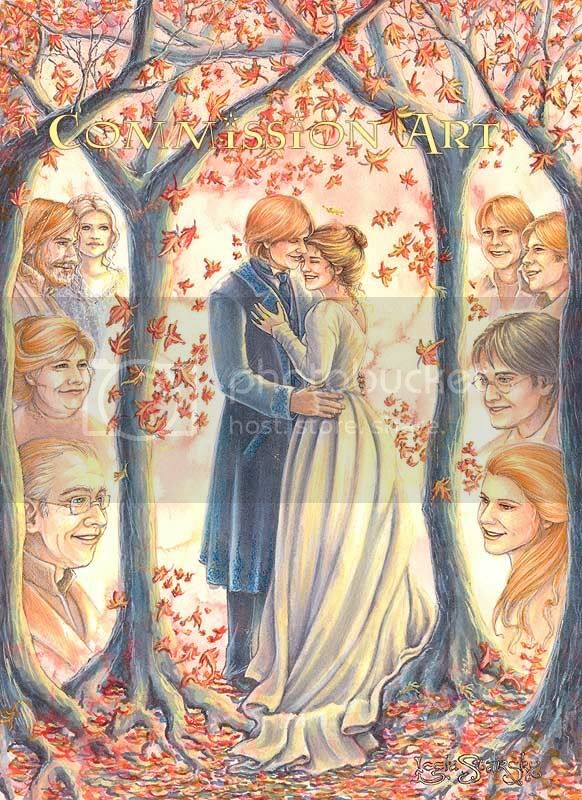 This one is for her story Something Borrowed, in which Ron and Hermione get married at the Nook, surrounded by family and friends. On the left-hand side - Bill and Fleur, Molly, and Arthur. On the right- George and Fred, Harry, and Ginny. This pic was rendered using watercolours, Copic markers, gouache and acrylic. This is so lovely! I adore all the leaves and Ron's outfit, rowr! Totally hot :D I adored the wedding in Linda's story and this is a great picture to go with it. OMG, this is absolutely gorgeous! The details and expressions are wonderful. And the bride and groom outfits! Really love Harry...and Bill and Fleur too...so much to LOVE about this piece! So precious. I love seeing Ron and Hermione together and getting married... it's so natural. Wow! So beautiful! I love the concept, and everyone looks really amazing. Fantastic work. This is absolutely gorgeous! I'm not a R/Hr shipper, but I love the happiness on their faces--all the facial expressions are wonderful. Thanks for sharing your work. I saw this as a sketch over at CM a few weeks ago and have been dying to see the finished art. And wow, it's beautiful! Everything is amazing but, I know this might sound odd, I love Hermione's chin and the folds in Ron's trousers the most. Oh, thankyou! What a lovely description! I do try to express the characters feelings in a painting, so I'm very happy that I was successful here. :~) Thanks for taking the time to comment! I never comment on your art, I always view it, and I really wanted to say I love this. So this is traditional media, you say? Amazing. I would be very interested in a tutorial! I love your Weasley family. All the characters, especially Arthur are more like what I imagined them to be like than the films.